Kim Hetherington is founder of Little Designs, an online shop selling illustrated pins, prints and greetings cards. Kim is the designer, order processor and package-upper and started digitally doodling in 2017 and has been creating cute things ever since. We chatted to Kim about how she started out and what projects she's working on next. What inspired you to start designing pins? Initially when I first joined Instragram, I noticed that the majority of the big Etsy sellers I was following sold their designs as pins and people seemed to love collecting them. I noticed that quite a few of these small businesses were able to turn their 'side hussle' into a full time gig, partly through selling their enamel pins which in turn, allowed them to create a more extensive product range. 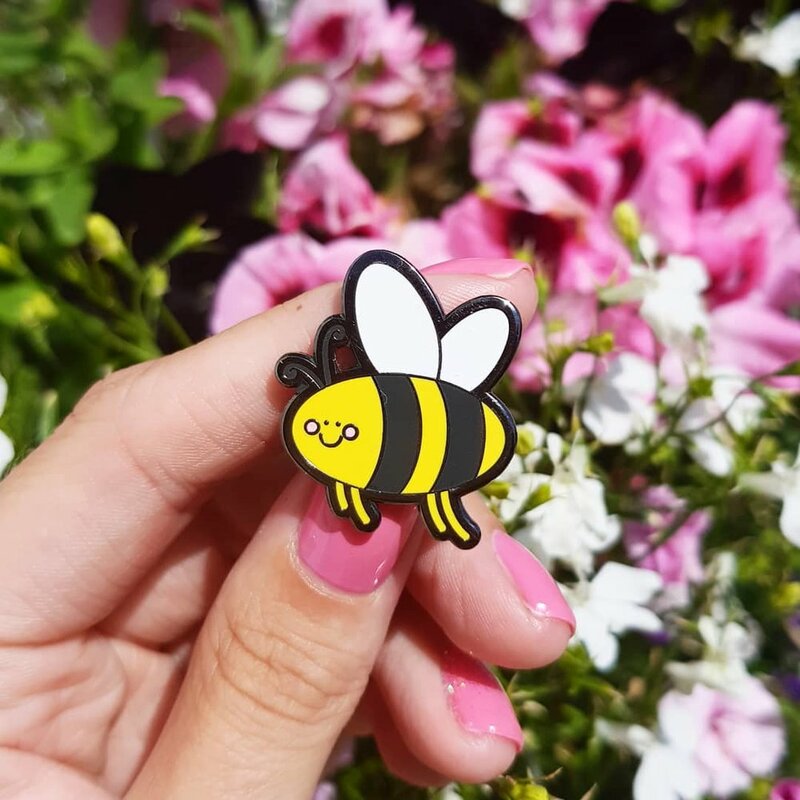 The idea of someone being able to collect my own designs was something that had always really excited me and after buying a few pins from my favourite small businesses, I thought it was time to take the plunge myself! It's an expensive and slow process but I am so glad that I went for it. My pins have quickly became my best seller on Etsy and at craft fairs. Are there any new projects/designs you're currently working on? I'm currently working on more pin designs! I love to keep one step ahead and gradually release new designs. I think it involves a lot of trial and error, but now I think I'm finally starting to grasp what works and what doesn't. My llama pin was recieved so well, that I've refreshed the design and sent it off to my manufacturer - so watch this space! I'm also in the middle of designing new greeting cards. I started off with greeting cards and that's definetly one area that I would love to keep working on too. My advice for anyone starting their own small business, or even thinking about it is to just go for it. If you have a passion or a flair for something, don't waste it. Do your research and start small, bringing out a few things at first to see what works. It's hard when you're just starting out to remember that that's exactly what you're doing - just starting out! You don't need to have a whole range of products and throw all your money into creating them. Another piece of advice that I think is so, so important is to not expect things to immediately fall into place overnight. There will be so many obstacles, setbacks and weeks of quiet spells. Good things take time and just because it happened quickly for someone on Instagram, doesn't mean it won't happen for you. I find that comparison is often the thief of joy and if you start to get wrapped up in how many sales or followers you have made in 'X' amount of time, you aren't going to enjoy the process. Don't be afraid to put yourself out there, and don't under-sell yourself just to make a few sales. People appreciate quality over quantity! How have you found the art/craft scene within Northern Ireland? I have been so surprised with the art/craft scene in Northern Ireland. I thought it would be an extremely hard community to become a part of, but everyone I have came across has been so friendly and genuinely want to see you succeed. I've done quite a few craft fairs that have been ran by the most fantastic bunch of people, who put their all into organising great events. I think the art scene is absolutely thriving, with some who have been doing what they love for years and some who are only starting to find their feet but are both accepted as equals, which is so refreshing. There are so many new opportunities out there for people in the creative field in Northern Ireland that I think didn't previously exist. Events like Belfast Design Week really help to promote small businesses and open the doors to other platforms. It's amazing to see how much people love to celebrate the creative industry.